RIGHT NOW: Red Siren alarms sounding in Ashdod. RIGHT NOW: Red Siren alarms sounding in Beer Sheba. Breaking on live TV (Live i24news) they just left the news desk for the bunker, Rocket attack. RIGHT NOW: Red Siren alarms sounding in Beer Sheba, barrage of Rockets launched. BREAKING: At least 40 Rockets fired moments ago from Gaza across Israel including Jerusalem, Tel Aviv and more, no injuries. You have 15 seconds to take cover! Run! Video is about a minute long but tries to show how hard it is to go about one's daily life while dealing with these rockets. I mean, 15 seconds? Jeez. I take a shower and ALL HELL STARTS TO BREAKS LOOSE. JERUSALEM UPDATE: Rocket exploded near Givat Zev area, no injuries reported. JERUSALEM UPDATE: At least 3 Rockets fired from Gaza, still unknown exact locations. ASHDOD UPDATE: Rocket fired moment ago hit a building. CAIRO, July 8 (KUNA) -- Secretary-General of the Arab League Nabil Al-Araby called on the UN Security Council Tuesday to hold an urgent meeting to take measures in order to halt Israeli aggression on Gaza Strip, which has left more than 14 people dead, and several others injured. "Consultations and contacts have been made with President Mahmoud Abbas about the latest developments in Gaza Strip," Al-Araby told reporters, pointing out that he continues his consultations with Arab foreign ministers in this regard. Araby expressed his deep concern about the serious Israeli escalation against the Gaza Strip. He warned at the same time of the consequences of the deteriorating humanitarian situation in the Palestinian territory due to continuous Israeli crimes and violations against Palestinian civilians. By these violations and crimes, Israel apparently violates international humanitarian law, Geneva conventions and international legitimacy resolutions related to the situations in occupied Palestinian territories. They may be running a taped segment now? Israel needs to VERY quickly crush Hamas before Hezbollah jumps in. NEW YORK, July 8 (KUNA) -- UN Secretary-General Ban Ki-moon on Tuesday "condemns" the recent multiple rocket attacks on Israel from Gaza, and was "extremely concerned" at the "dangerous" escalation of violence which led to multiple deaths and injuries as a result of Israeli "operations" on Gaza. Spokesman Stephane Dujarric told the daily press briefing that the indiscriminate attacks from Gaza on civilian areas "must stop," reiterating Ban's call on all actors to exercise "maximum restraint and avoid further civilian casualties and overall destabilization." "It is imperative now to restore calm. The unsustainable situation in Gaza will also need to be addressed in its political, security, humanitarian and development dimensions as part of a comprehensive solution," he added. Ban's statement came as Israel bombarded Gaza today, killing at least 11 people, and vowed a long-term offensive against Hamas which sent scores of rockets on Israeli towns. Asked about Palestinian President Mahmoud Abbas' request for an international and independent UN investigation into the death of Palestinian teenager Mohammad Abu Khudeir last week, Dujarric practically said the request was declined. "There is an investigation going on by the Israeli authorities ... We have seen a number of arrests in this case, and we hope the investigation will continue, will be thorough, and that the perpetrators will be brought to justice," he said. Abu KhUdeir's killing was apparently in retaliation to the killing of three Israeli youths the week before. Whoever the hell Daniel Gordis is . . .
WASHINGTON, July 8 (KUNA) -- The US strongly condemns the continuing rocket fire into Israel and the deliberate targeting of civilians by "terrorist" organizations in Gaza, White House press secretary Josh Earnest said on Tuesday. "No country can accept rocket fire aimed at civilians, and we support Israel's right to defend itself against these vicious attacks," Earnest said during a briefing. US officials appreciate the call that Israeli Prime Minister Benjamin Netanyahu made publicly for parties in the conflict to act responsibly, Earnest said. "We are concerned about the safety and security of civilians on both sides," Earnest said. "This means both the residents of southern Israel who are forced to live under rocket fire in their homes and the civilians in Gaza who are subjected to the conflict because of Hamas' violence." Secretary of State John Kerry spoke with Netanyahu a couple times over the weekend and reiterated the US' concern about escalating tensions "and our willingness to engage robustly in helping to stop the rocket fire and restore the 2012 cease-fire as soon as possible," Earnest said. "So these kinds of consultations are ongoing." It is not in the interest of either side for this violence to continue and even to escalate, he said. "So we are hopeful that even as Israel exercises their right to self-defense that they will leave open a channel for diplomacy to prevail and for a cease-fire, or at least a de-escalation in the violence, to commence," Earnest said. BREAKING UPDATE: Rocket fired towards Jerusalem hit a residents building in Jerusalem, no injuries reported. 9:52 P.M. Sirens sound in Jerusalem, Binyamina, Be'er Sheva, Rehovot and Ra'anana. 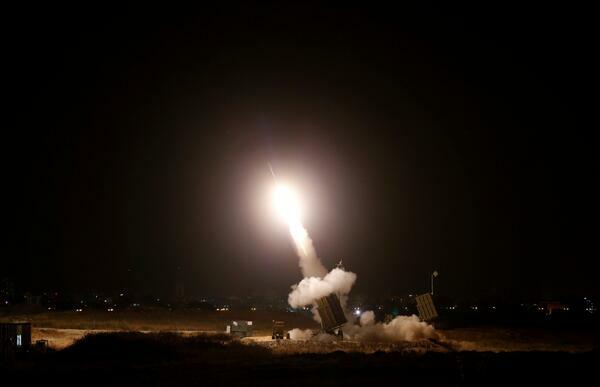 Iron Dome intercepts rocket over the greater Tel Aviv metropolitan area. ASHDOD UPDATE: Rocket exploded next to a wedding hall, emergency units responding starting to evacuate before additional rocket firing. Heh, Fox actually got one right? Usually Shepard Smith and his cohorts just blurt out anything on the air. PHOTO: Long range rocket fired towards Jerusalem, exploding in Givat Zev. RIGHT NOW: Red Siren alarms sounding in Ein Hashlosha. Hamas has claimed responsibility for the rocket attacks on Jerusalem. Un-Confirmed reports say that a missile has landed near The Knesset in Jerusalem. 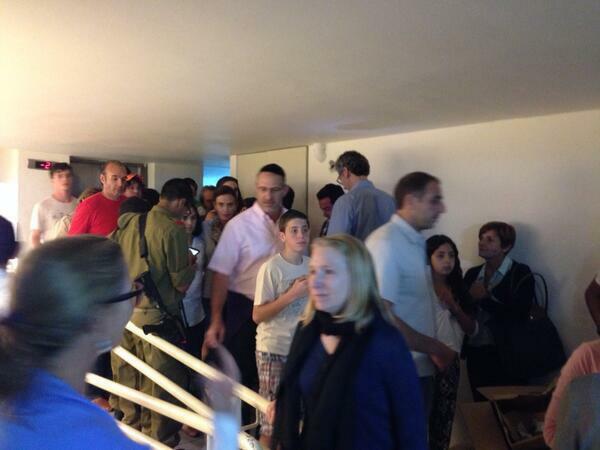 BREAKING PHOTO: People in Jerusalem bomb shelter moments ago. 30 rockets in last volley across south+central Israel. No direct impacts, incl Jerusalem. Hamas says it launched new missile to reach Haifa. Each Iron Dome interception costs an estimated $50,000. Israel News Feed @IsraelHatzolah · 1m Hamas claims responsibility for firing of 4 rockets on Jerusalem, 4 on Tel Aviv, 12 on Ashdod and 1 on Haifa. Israel’s military confirming rocket fired from Gaza explodes in Jerusalem area, Appears no one was injured. 150 miles north of #Gaza. The canaanites and phillistines have really opened the doors of Hell wide open this time. Time for Israel to seriously clean up the muzzie madness mess. Dunno, but they're not exactly ideal "Peace Partners" for Israel. RIGHT NOW: Red Siren alarms sounding in Yad Mordechai. ^^^^like I posted earlier, the Pali's don't let the Israeli's know. RIGHT NOW: Red Siren alarms sounding in Rishon Leziyon and surroundings.